As long as I can remember vampires have been popular. Some may think it’s just a fad, but ever since “Dracula” was published in 1897, vampires have captured a place in our collective imagination. Currently there are several books and book series on the market in which vampires feature prominently. Charlaine Harris’s Southern Vampire novels and Laurell K. Hamilton’s Anita Blake series are just two of my favorites. Don’t forget Anne Rice’s classic “Interview with the Vampire” and the hugely successful Twilight series. Many of these tales have been translated into film, and there are hundreds of movies with vampire characters. From the sympathetic Blade in the series of that name to the wide-eyed adolescents of The Lost Boys to real baddies like those in Fright Night – good guy or villain – we run to queue up at theatres to get our fix of romance/horror. In the 60’s and 70’s there was one vampire that I would literally run to see every weekday. He was on TV every afternoon at 3:00. The problem was that my bus did not bring me home until about 3:10 or 3:15. This gothic soap opera was a half hour program and I barely got to see the last 10 to 15 minutes of it. The program was called “Dark Shadows” and the vampire who made himself at home among the unsuspecting citizens of Collinwood was named Barnabas Collins. This particular blood sucker was played by a Shakespearean actor named Jonathan Frid. Frid has taken his final taxi at the age of 87. The character Barnabas Collins was a 200-year-old vampire who roamed in search of fresh blood and his lost love, Josette. He was brought into the ghost-infested soap in hopes of boosting its low ratings. Originally this was to be a brief role for Frid. He was booked for only 13 weeks, but the unheard of introduction of a vampire into a daytime series caused ratings to rise from the crypt and soar like a winged bat fluttering outside a heavily curtained castle window. Frid/Barnabas became the star of the show. Frid did not expect Barnabas to be the one character that would define his acting career. He had only taken the role to pay for a move to the West Coast but scrapped other projects once the ‘short role’ became a major one. 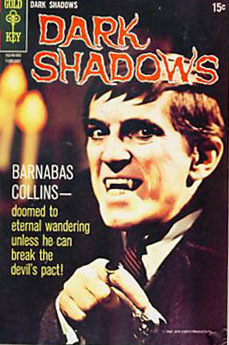 He played Barnabas untill “Dark Shadows” ended in 1971, after a five year run. He also played the vampire in the 1970 movie “House of Dark Shadows.” Frid had a few other TV and movie roles, but type casting bogged him down. He eventually returned to his first love, theater, in 1978. Frid had a love/ hate relationship with Barnabas but eventually embraced the character, showing up at Dark Shadows conventions and even reprising the role in the new soon-to-be-released Tim Burton movie by the same title. Frid will play the older Barnabas Collins catching a glimpse of his younger self, as played by Johnny Depp. To show you the popularity of the role Jonathan Frid developed, one of my favorite memories is of being in second grade and getting permission from my Mom to buy a book through the “Weekly Reader” book sale. 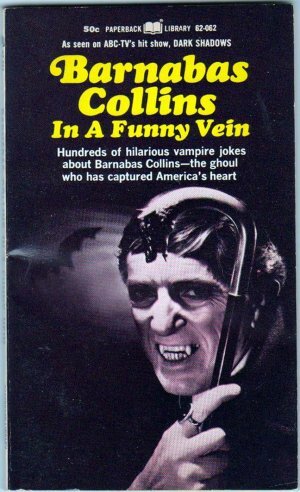 I dashed in that autumn afternoon, clutching my copy of a little vampire joke book called “Barnabas Collins In A Funny Vein” just in time to tune in to Dark Shadows.